Places to go backcountry skiing are abundant in the surrounding Sandpoint area, and most are accessed via Forest Service roads. Obtain a forest map from the Sandpoint Ranger Station in the Federal Building on Highway 2. 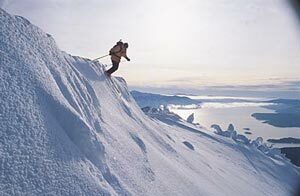 It is a long distance into many of the choice peaks; a snowmobile will shorten your approach to these choice slopes. Trestle Creek has a snowmobile parking area about 4 miles from Highway 200 to access the Cabinet Mountains near the town of Hope. From there you can head up to Lunch Peak or Moose Lake, about a 30-minute and 1-hour ride respectively. For those not equipped with snowmobiles you can climb Round Top accessing it via the Road 1082 from Trestle Creek and route finding your way up one of the ridges to the summit. In decent conditions this is about a 4-hour climb to the summit. In the Selkirks to the north of Sandpoint, Upper Pack River Road is a good access to great skiing. About 8 miles up that road from Highway 95 is Jeru Creek Road, well marked and offering a large parking area. From here you can access numerous skiable peaks. The Jeru Peak area offers excellent skiing and touring possibilities. Nearby, up French Creek, is the Caribou Mountain Lodge; if you seriously like backcountry touring here, you may want to opt to stay here a couple nights. Look up www.cariboumountainlodge.com. Then of course theres Schweitzer. Sometimes you just cant beat good old-fashioned, lift-served access. Schweitzer has an open policy on backcountry skiing. This means that you are open to be responsible for your own well-being and knowing the grounds of the policy if you decide to leave the ski area boundary. See story, page 18. Before you head out, get the most recent weather information and avalanche conditions. The Forest Service issues an avalanche advisory that updates snow stability each weekend. Call the hotline at (208) 765-7323 or access it online at www.fs.fed.us/ipnf/visit/conditions/backcountry. Carry the proper safety gear and know how to use them effectively. And always travel with an experienced partner, preferably one who is better at using the safety gear than yourself. Last summer, for instance, I was eating a hot fudge sundae and became transfixed by the way the hot fudge was oozing down the creamy vanilla scoop. It reminded me of being on top of Beehive near the Seven Sisters in the Selkirks. Lance Gidley, a frequent ski partner, and I had planned upon skiing around the cirque north of the Sisters when we found ourselves at the top of Beehive scanning down upon its convex flanks. Tired from the ascent, we paused. The cirque looked bigger than we had expected. However, below us I could see a multitude of choices, and all looked rather intimidating. Lance agreed with my trepidation but confided that the snow conditions could not be better. It was 10 oclock and the first rays of a cloudless morning were just beginning to soften the solid snow. We may never have this kind of an opportunity again, we rationalized. Then, grinning and giving each other an affirmative nod, we pushed off and slid forward. Hesitantly at first, we picked up momentum and glided into a side-to-side rhythm as we melted into the fall line. The world fell away on all sides. To my left Lance was sending up contrails of snow as he careened down the mountainside with Harrison Peak as a backdrop. Honey, you have ice cream on your face, my wife politely tells me, snapping me out of a Warren Miller moment. Even in the waiting room at the doctors office, of all places, I drifted off into an otherworldly place after picking up a Dr. Seuss book. High on the ridgetops of Mount Casey, just northwest of Schweitzer, the gnarled and twisted forms of snowghosts create a winter scene that is quintessentially northern Idaho. We can thank Ross Hall for this distinction since it was his adventurous spirit and imaginative eye that captured famous, historic images of snowghosts in the local mountains. And this local peak is a veritable garden of snowghosts. Top: The Selkirks Keokee Peak and Mount Casey invite backcountry explorers. 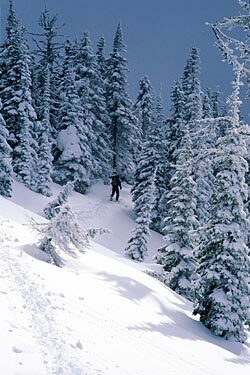 Left: A trekker makes his way through the trees along the Selkirk Crest north of Schweitzer. Above: Lance Gridley pushes off from Round Top in the Cabinets. Up where the cold wind blows hard and driving snow plasters itself to anything rising above the scoured surface, snowghosts make their home. Some are angular and scaly like the biting wind that formed them. Others appear jolly with their bulbous heads cocked to the side, leaning towards one another, towering above, as if they are inspecting me, a colorful curiosity. I could ski for hours, high in the mountains, getting lost in the gallery of ghosts, but as always gravity grips me and Im off silently swishing through a vertical forest where every turn is concealed from the next.Oftentimes I am caught unaware, come summer when my brain has thawed, and I think it would be nice to spend a winter in the tropics. But then there I am, at City Beach, gazing out over the dappled lake, waves glinting with sunlight, and I have a vision of inch-deep surface hoar, the big crystals that sound like tinkling shards of glass when you ski through them. Lance and I were skinning up to the summit of Round Top through featherlike flakes reflecting sunlight like millions of tiny mirrors. The farther we climbed upward, the larger the flakes grew. Each step chimed with the splintering crystals. At the 6,153-foot summit we took a moment to gaze out over the azure lake and the surrounding mountains. Round Top, just northeast of the town of Hope, offers a splendid panorama with views extending from Montana to Washington, into Canada, and a unique angle down the axis of Lake Pend Oreille. It is always hard to leave a beautiful vista, but it is harder to detain oneself from 2,000 feet of untracked powder. Since I had been here before, I let Lance have the honors. As usual he skied the choicest line unfalteringly, and I questioned why I let him go first. But all regrets vanished as soon as I dropped in off the summit cornice. On contact my skis were quick to tell me that under the surface hoar was a firm base. I could have fun with this, I mused. It had to be the closest thing to groomed runs in the backcountry that I had ever experienced. Turning came effortlessly and I found myself zinging from side to side through open terrain, then leaning into my edges and linking some long GS turns. Swooshing in next to Lance at the bottom, we looked up to check our handiwork. Ahhh! My contentment was similar to the feeling I had looking across the water from City Beach, thinking about that day last winter. From Sandpoint you can see the summits of numerous peaks. These are the ideal places to get out and tour around, whether you ski, snowboard or snowshoe. To me, every mountain is an empty canvas waiting for a creative touch to complete the picture. It is a satisfying feeling to see your tracks winding down a distant mountain. You will be reminded of the adventure, camaraderie and sense of accomplishment you felt that day. If you have symptoms like this already, you may have a case of frostbite yourself. Kevin Davis will have a new ski partner soon. He and his wife, Mel, are expecting their first child in December.